An upcycled torrent of righteous thunder. Zhalo Supercell is a new Exotic primary auto rifle that was introduced with The Taken King – this weapon can be sold by Xur!. The good: Strong PvE perks, elemental primary. Conclusion: One of the best PvE primary weapons! Arc projectiles have the chance to chain lightning when enemies are close together. Double kills with this weapon charge a small amount of Super energy and return ammo to the magazine. As Year 2 Exotics begin to trickle slowly into circulation, we’ve been getting a lot of requests for reviews. At Planet Destiny, one of our top priorities is providing comprehensive analysis on Exotic gear. With every new expansion, a new series of weapons vie for relevancy in a metagame that is loosely defined. Today, we’ll try to clear up some of the haze, by taking a look at one of the most exciting of the new Exotics, the Zhalo Supercell. This Exotic Auto Rifle can be obtained from a Legendary Primary Weapon Engram, albeit at a very low chance, or as a random drop reward from various activities such as Nightfall Strikes. The Zhalo Supercell is a high-RoF/low-Impact model, à la Monte Carlo and Hard Light. Bungie has shown preference towards this archetype with recent releases, with popular TDB variants “Up For Anything” and “For The People”, and HoW equivalents. This profile offers a fairly nice balance between control, raw damage, and DPS. It technically lacks the DPS of the fastest-firing models, but in practicality you will do more DPS with the Zhalo over a model like Necrochasm, simply because you’ll be able to score headshots and keep your reticle on target more easily. With the Auto Rifle revamp in 2.0, Auto Rifles have a much more well-defined niche. Their extra damage is a worthy consolation prize for the nasty nerf they took to base Range and Stability, and as such you’ll be focusing in using them in close-to-medium range encounters. Beyond that, reticle climb will begin to become bothersome on all but the highest stability weapons, and damage falloff will kick in long before you feel it should. A good Auto Rifle now is one that has the magazine capacity, damage potential, and overall stability to churn through lower-tier enemies when they’re pressing hard. 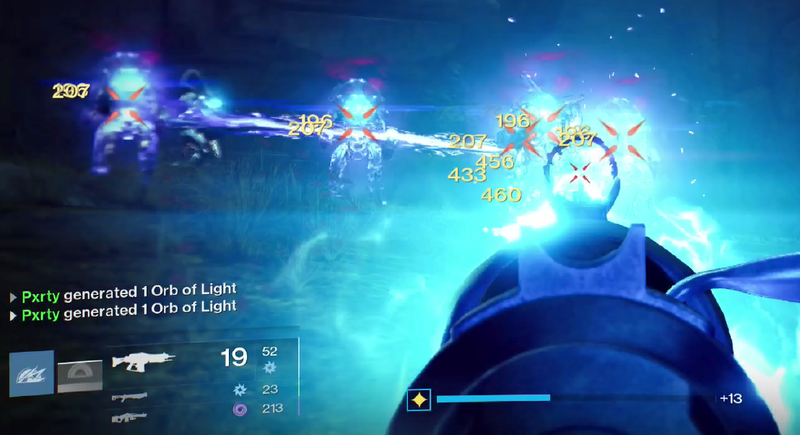 Taken Psions, Thralls, and Acolytes – these are the baddies against which a properly spec’d Auto Rifle will be ideal. The Zhalo Supercell has a fairly rudimentary set of base stats. Beyond its RoF/Impact profile, its Range of 28 is above-average for its class, though certainly not a standout compared to its main competition. For comparison, the Monte Carlo boasts a whopping 41. However, other than the TDB-only For The People and HoW Don’t Hold Your Breath, it actually sits near the top of its RoF/Impact class as far as Range is concerned. This is essential; Auto Rifles need all the help they can get in this category. Its Stability of 46 is low. 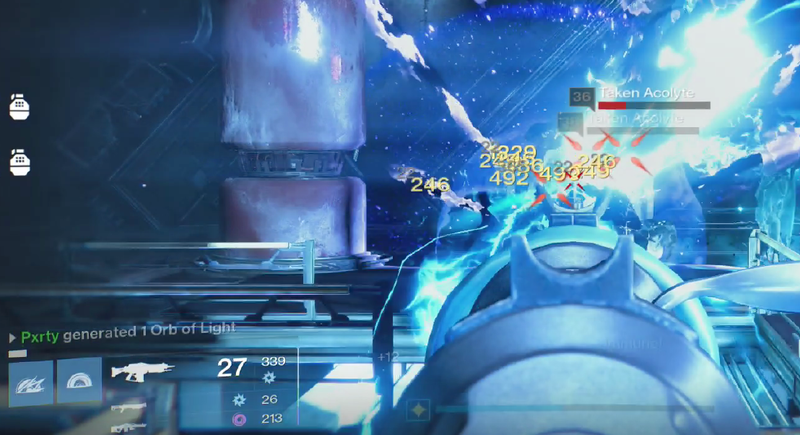 There are a multitude of Auto Rifles with the same RoF/Impact that completely outclass it in this category. Silimar’s Wrath, Hard Light, and a collection of Rares and Legendaries are all better picks for sheer stability. As we’ll see later, the Zhalo can remedy this stat to an extent, but it’s an outlier when just taking a look at the bare bones picture. As far as ammo conservation and management is concerned, the Zhalo scores well. Now that Field Scout isn’t buffing its retro-competitors, the Magazine Size of 36 is more-than-acceptable, especially when paired with its strong base 76 Reload Time. Unfortunately, it is again outclassed in both of these categories by its stiffest competition in Hard Light and Monte Carlo, but evaluated in a vacuum, most Guardians will be very pleased with how their Zhalo handles its ammunition, even without its upgrades. Your first-row ballistic options are pretty bog standard, but well-suited to the weapon at hand. The choice boils down to taking the onus of managing the recoil from the player, or doubling down on its tricky handling by going all-in with DPS. CQB Ballistics will offer unparalleled recoil reduction, but at the cost of a hefty penalty to your range. Smart Drift Control is much in the same vein, but its penalties and benefits are both less marked. The real wild card is Aggressive Ballistics which, providing you can handle the kick, will amp up the power of the Zhalo’s rounds. Cycle through these liberally. When you need to hit your headshots at all costs, you’ll probably opt for CQB or SDC, but if you’re going headfirst into the fray to spray and pray, then Aggressive Ballistics should be your go-to. Zhalo’s first distinct perk, Persistence, is an intuitive pick on Bungie’s end. You’ll be chewing through ammo fast, especially with the only-average Magazine Size of 36. When you reach about halfway, you’ll begin to notice the weapon stabilizing adequately. Video footage shows that it isn’t jarring enough to throw off your aim correction, and it’s a smart perk overall, because it targets a weakness of an Exotic with the sole purpose of patching it up. Testing of Persistence in the past has shown it to be more noticeable on certain weapons than others, and Zhalo appears to be one of those weapons on which its effects have a non-negligible benefit. An excellent talent for PvP and PvE. The middle row offers some serious choices to really define a role for your Zhao Supercell. If you’re reticent to sacrifice any of its stats, Hammer Forged offers a no-strings-attached boost to Range and Accuracy. It’s not much, but can be enough to offset the penalties of CQB Ballistics and Smart Drift Control. If you really want to extend the kill distance of the Zhalo, you’ll be angling for Rifled Barrel instead. At the reasonable cost of Reload Speed, your Range will be extended to its maximum potential distance, which will be invaluable for certain engagements in PvP. Combine it with Aggressive Ballistics for the most manageable damage drop-off. 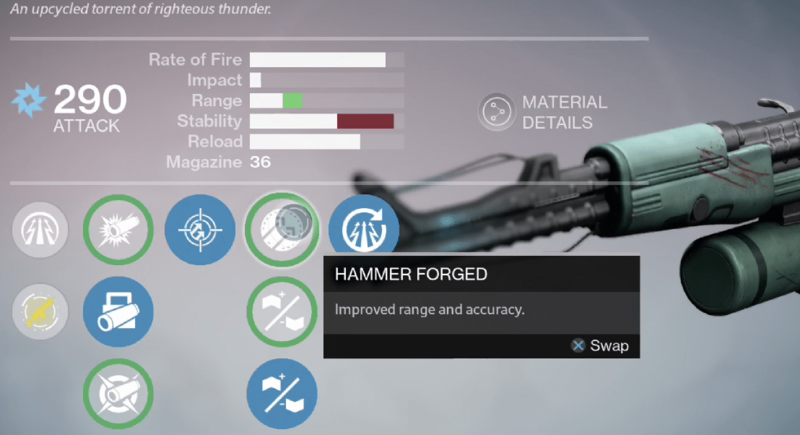 Finally, if you’re looking to tame the recoil as much as possible, you can opt for Braced Frame. When combined with an appropriate ballistics option, you can nearly max out your Stability. Still, the tradeoff is a pretty significant 8 rounds from a magazine that can’t really afford to lose that many, so this is a risky, Crucible-only choice in our opinion. The Innate Perk, Zhalo Supercel, and Bolts from the Blue, are what really gives the Zhalo its staying power. 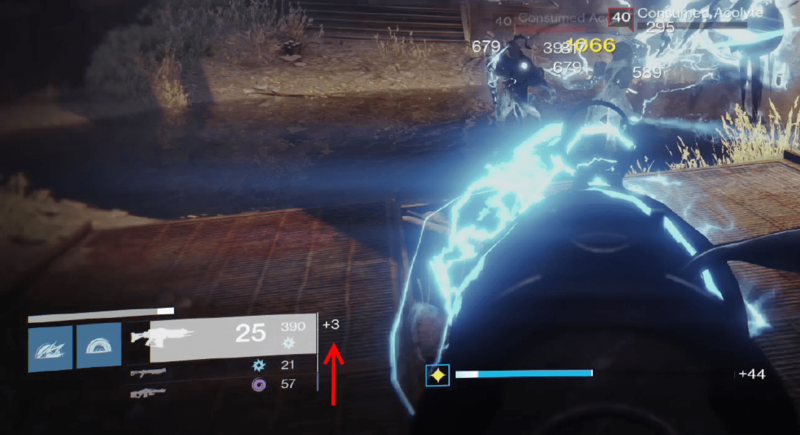 Bolts from the Blue grants additional Super Energy and ammunition directly to the magazine following any double kill, and the Innate Perk occasionally procs a chain-lightning AoE on a random round that makes contact with the enemy. For PvE, both of these perks are a godsend. Any trash-level group of enemies can be disposed of with minimal effort, as the Zhalo sends deadly electricity coursing through them all while effectively buffing its magazine to very high levels as every two are felled. While getting kills is already the best way to charge your Super, footage shows that the bonus for a double gets your yellow meter moving very quickly toward the top. It doesn’t quite hit Bad Juju’s level of insanity, but considering how many double kills you’ll be scoring, it’s nearly as good. 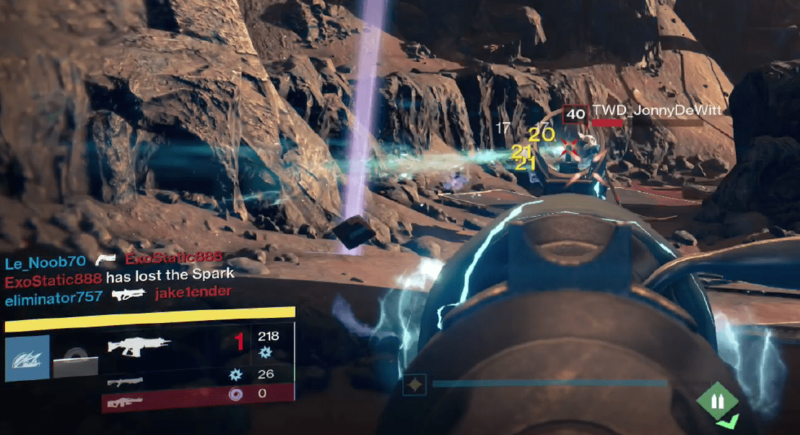 From Patrick’s test footage, the ammo portion of the perk appears to refund about 1/3rd of the magazine for a double kill, and the lightning proc is frequent, if inconsistent. Patrick saw great success pairing this with the Nightstalker’s Void Tethers, and we imagine most subclasses would be grateful for the CC and DPS of Bolts from the Blue. It’s great to see an Exotic Perk really making the weapon. If you hadn’t noticed, we’re thrilled about this weapon for PvE. While an Auto Rifle is never going to be your top pick for dispatching bosses, it lives up to its calling of a pure add-killing machine. Although we haven’t mentioned it until now, the Arc damage is a huge reason to keep the Supercell in your arsenal; TTK is lacking the repository of elemental primaries that we’ve enjoyed since House of Wolves introduced Ascension. Anything with no shield or an Arc shield is fair game for the Supercell, and the fully upgraded Auto Rifle will cut through those foes like a hot knife through butter. It struggles a bit with Void or Solar shielded bad guys, but it would be foolish to not switch out early and often when you encounter bulkier targets. The Zhalo is a very momentum-based gun. You need to score double kills and put a lot of bullets downstream to really make it go to work for you, and you can’t do that if you’re emptying a clip just to take down a Minotaur’s shield. Plan a Solar and Void Special and Heavy Weapon to cover your elemental bases, and play smart, and you’ll be delighted with what the Supercell can do for you. The Zhalo Supercell also succeeds in PvE not just because of what it does, but because of what enemies do not do. They are not hyper-responsive like other Crucible Guardians, and they will not down you with a single Shotgun blast if you close too quickly. To this end, the Supercell can be used right up in their faces, and Guardians can shrug aside issues of range, stability, and damage drop off. If you insist on maintaining your distance, you’ll be using this weapon incorrectly and it will function simply as an average Auto Rifle with below-average Range and Stability. A fast-firing Auto Rifle like this one is a calculated choice – not an all-purpose weapon – and it’ll thrive when you know the content you’re heading into, and can manage your engagement distance deftly. It’s less of a standout in PvP, but is by no means a slouch. Auto Rifles in general are much-improved, and a given PvP game these days will feature several Guardians terrorizing the field with controlled bursts of automatic fire. If you choose the Zhalo over another, it’s really going to come down to how it personally feels in your hands. You’ll be doing the same damage as any high RoF/low Impact model, so if you’re opting to consume your Exotic slot with the Supercell, be sure you’ve tried out the new-and-improved Monte Carlo and Hard Light – each has some excellent things going for it. Its Innate Perk will come in handy every now and then, whenever two or more Guardians are bunched up on an objective. We recommend you watch Mr. Fruit’s gameplay footage to see the Supercell in the hands of a smart player. He manages to proc Zhalo Supercell several times to weak one or more opponents, and in a game mode like Rift, every bit of residual damage helps the team out. He ends up with a killstreak of around 30, but it’s hard to attribute that to the weapon. By maximizing its range, he’s able to improve the hitscan hitbox and score headshots and longer range kills, but you can see the weapon still kick considerably. Ultimately, the Supercell in no way hurts your chances in PvP, and in fact can facilitate extreme success. Its open sights and low zoom factor are actually an underrated boon, offering an unobstructed FoV and the confidence in knowing that your shots are going to land right where you’re aiming. If you’re able to get a handle on the Supercell, the Crucible can be as good a place as any to wield its power – even if you’re not taking advantage of all its neat tricks. Bungie did well with this one. The classic bullpup design is an instant standout among a field of weapons that at times frankly look – and sound – like nerf guns. The Supercell is reminiscent of an Steyr UG or Ak-74 that has been infused with Arc energy. Indeed, sparks of electricity lick dangerously about the reticle and barrel as you ADS. These are subtle enough to not be obtrusive; Bungie clearly learned its lesson with Bad Juju. The pale green color is understated and clean, if not outright beautiful, and fits the functional aesthetic to a tee. 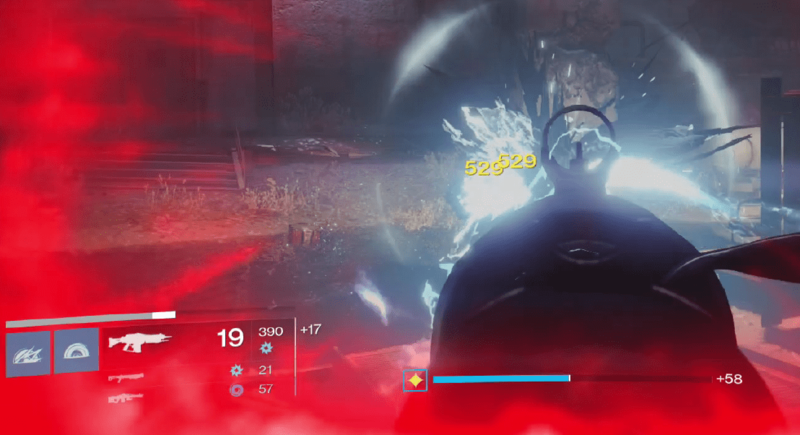 We’re glad that this was the first weapon we got to review for The Taken King. It represents everything an Exotic should be, with a unique design, and a set of fun perks that can be deadly, while never bordering on overpowered. Its average base stats belie an untapped potential that can be unleashed with a proper playstyle and an appreciation for what the weapon does best. In PvE, this means unparalleled crowd control, taking advantage of a generous magazine and chains of Arc lightning. In PvP, it means spec’ing for control or range, according to the distances at which you do best, and reaping the benefits of flanking and staying mobile. With a cool look and cooler talents, the Zhalo is a classic Exotic for the new age. For PvP this weapon earns a 8.5/10 and for PvE a 9.4/10. Previous Post:April Update Preview! Prison of Elders Refresh?